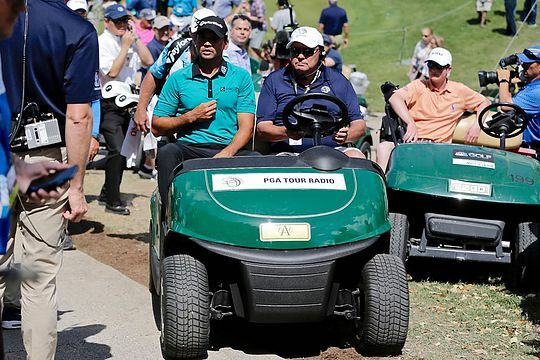 There is a serious injury cloud over Australia’s Jason Day after he was observed down on his knees in back pain on the first day of the WGC – Dell Match-Play Championship in Austin, Texas. Day was experiencing shooting pain in his lower back and legs after his tee shot at the 15th and then was clearly in real agony at the side of the 16th green where he managed to win his match 3&2 against Northern Ireland’s Graeme McDowell. The injury could not have come at a worst time for the Australian what with the Masters just a fortnight away for last week’s brilliant Arnold Palmer Invitational winner. Walking with the Day -v- McDowell match was renowned Australian Associated Press (AAP) leading golf correspondent, Ben Everill. “It’s really hard to play with searing pain in both sides of your back,” said Day. Ben then spoke to Day after defeating McDowell 3&2. “I am really struggling as my back has seized up and I need to get back to the clubhouse and for treatment and see what’s wrong,” said Day. WGC officials advised Day could, under the rules of the $US 9.5m event, withdraw from playing his match tomorrow against Thailand’s Thongchai Jaidee and instead, and if he was fit enough, tackle England’s Paul Casey in what would be his last round robin encounter. However there is the wider concern for Day that if he did continue this week in the Texas capital it could very well hinder his Augusta National aspirations. Of course, we all remember those terrible scenes from last year’s US Open at Chambers Bay when Day collapsed suffering vertigo.